SMARTER. FASTER. AND STILL NO CLEANUP OR PACKING CORD. 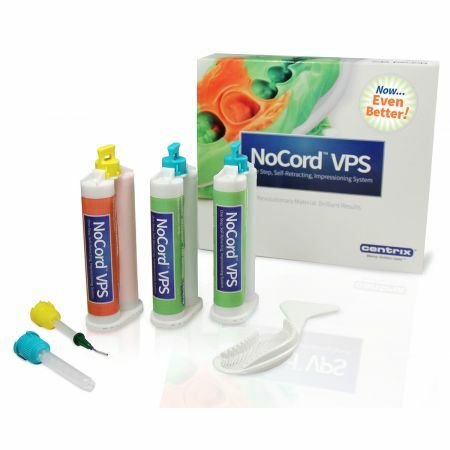 GingiTrac is a medium-viscosity, vinyl polysiloxane (VPS) gingival retraction paste with 15% ammonium aluminum sulfate (alum) that gently displaces the gingiva from the tooth and stops bleeding. 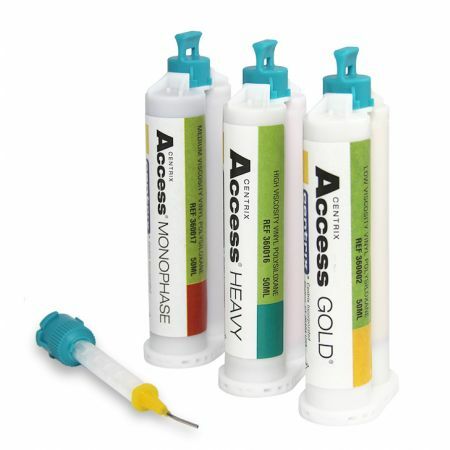 When used with GingiCap™ compression caps, the mechanical bite pressure of GingiCap combined with the astringent action of aluminum sulfate works to control bleeding and seepage in just minutes. GingiTrac cleans up easily and completely, without tissue trauma. GingiTrac is compatible with all impression materials and can be used as the second cord in a 2-cord technique. And GingiTrac serves as its own preview of the final impression so you can be sure of a quality impression every time. 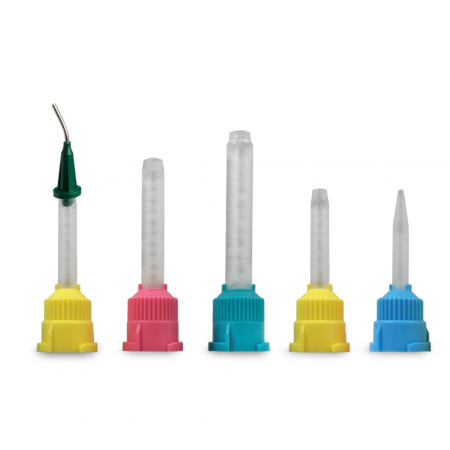 GingiTrac MiniMix: Simple, easy to use system that is more patient friendly and easier to access all areas of the mouth. 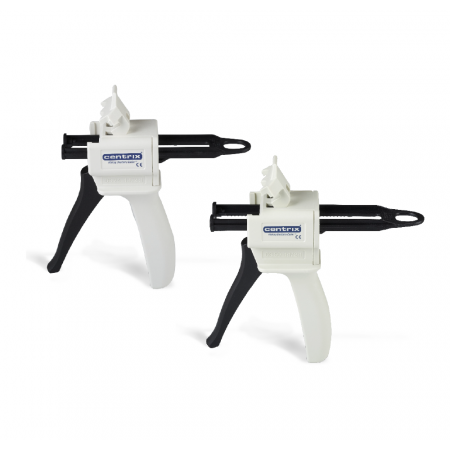 GingiTrac Automix Cartridges: Traditional 50mL cartridges plus SuperMixer™ mixing nozzles that reduce waste 33% and yield 10 more applications per cartridge. How does GingiTrac retract the gingiva? Using the bite pressure of the patient, GingiTrac pushes on the gingival trough. Like retraction cord, this constant pressure over time stretches the tissue away from the tooth prep. 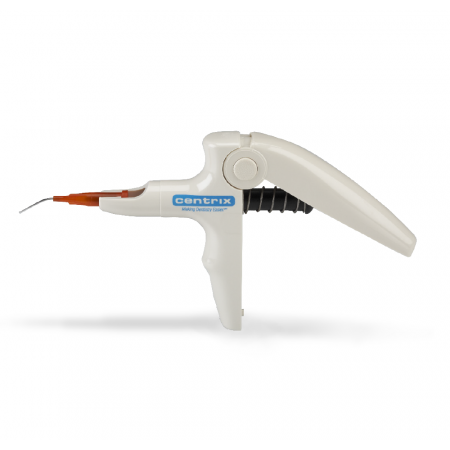 Unlike retraction cord, which needs to be forced in with a packing instrument, GingiTrac uses a combination of bite pressure plus astringency over time. Will removal of GingiTrac restart bleeding? No. Unlike cord which contains fibers to which the coagulum can attach, GingiTrac is silicone, and does not provide a surface for attachment. What are the black fibers in the retraction material? The black fibers in GingiTrac are for a visual reference only, so as to differentiate the material from impression materials. They are rayon cut fibers. The fibers are not metal. What does GingiTrac taste or smell like? GingiTrac has a slight mint taste and smell. Why won't the materials set? Silicone material like Matrix and GingiTrac are sensitive to latex and rubber. We recommend using vinyl gloves when handling this two materials. Additionally, the GingiTrac material may not mix correctly when first expressed from a cartridge. The base [green] material is much more viscose then the catalyst [white] material. We recommend expressing a "pea- size" amount from the cartridge WITH nozzle off to the side, before dispensing the material around the prep or into the matrix. Can I use the set GingiTrac as my final impression? No. The rebound effect of flexible silicone materials will cause any die poured from this impression to be too small. The resulting crown will not fit. The only way to compensate for this is to use several coats of die spacer on the lab die. We do not recommend using the GingiTrac impression as your final impression. Your lab will not like it. How does hemostasis occur at a cellular level? Alum is known to have an astringent and reinforcing effect on proteins. The compound causes superficially damaged and dead cells to be combined and shed. This leads to a reduction in local blood and fluid circulation. Will it affect the setting/accuracy of my final impression? No. When polymerized GingiTrac is removed from the mouth, nothing is left behind. A slight rinsing and drying of the impression site will insure consistent results. Can I use my own fast bite VPS material as a matrix? Yes. 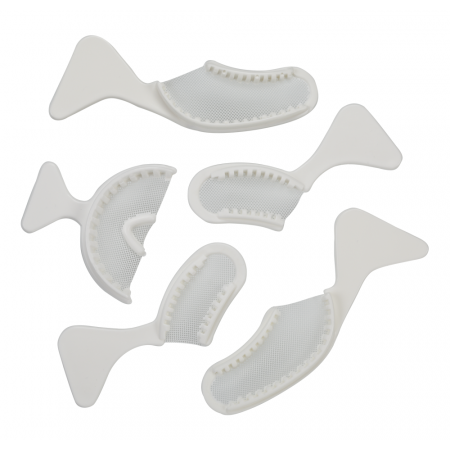 Centrix has not tested any other fast bite materials with GingiTrac so we do not guarantee the same results. But most fast bite VPS are the same. How should this material be stored? We recommend storing in a cool, dry place (5-25°C / 41-77°F). And we recommend leaving the mixing nozzles on cartridges until next use for the 50ml cartridges. Will GingiTrac distort the final impression? No, GingiTrac has sulfates in its formula. Sulfates do not distort impression materials. Sulfur or Free Sulfur [which some gloves contain] will distort impression materials. These two materials do not share the same chemistry. Prepare the tooth as normal. If excessive bleeding, use a hemostatic/astringent agent. For Single Tooth Preparation: Select appropriate size GingiCap, then proceed to Step 5. Purge the GingiTrac Matrix cartridge without the mixing nozzle to ensure that both the catalyst and base are being equally expressed, and then attach the mixing nozzle. Express GingiTrac Matrix into a plastic tray and place over the prepared teeth. Use a cotton roll on the opposite side to prevent full closure. Matrix will set in 30 seconds. Remove from the mouth, rinse and dry. Attach the mixing nozzle to the GingiTrac Retraction cartridge, express a "pea-sized" amount and discard. This is to ensure that the catalyst and base are being mixed thoroughly. 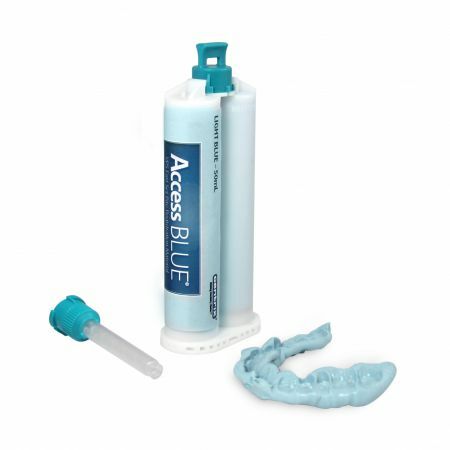 Fill the GingiCap, or Access Blue impression, with GingiTrac Retraction material. Do not allow filled GingiCap to remain at room temperature for more than 1 minute 30 seconds, otherwise material will harden. 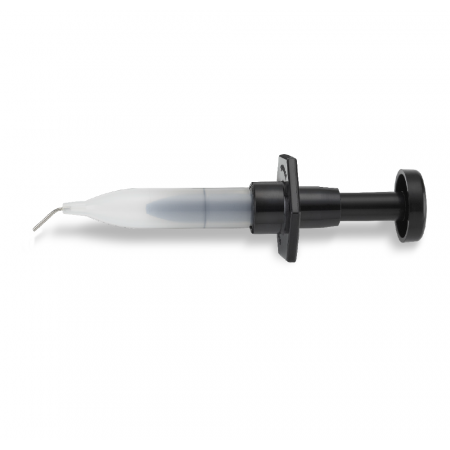 Syringe the GingiTrac Retraction material directly around the tooth preparations’ margin using the included dispensing tip. Place the filled GingiCap over the preparation. Have patient close with firm but not excessive pressure. 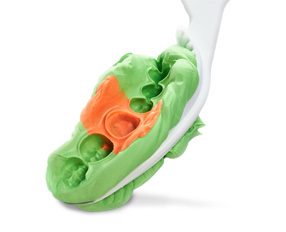 Wait 2 minutes, depending on the amount of bleeding or oozing, for complete set and retraction. Remove the set GingiTrac. Check for complete retraction. If needed, repeat steps 6-9. If necessary, gently rinse and dry the prepared teeth. You are now ready to take your standard impression. Attach the mixing nozzle to the GingiTrac Retraction MiniMix. Express a "pea-sized" amount and discard. This is to ensure that the catalyst and base are being mixed thoroughly. Fill the GingiCap with GingiTrac Retraction material. Do not allow filled GingiCap to remain at room temperature for more than 1 minute 30 seconds, otherwise material will harden. Remove the set GingiTrac. Place the filled GingiCap over the preparation. Remove the set GingiTrac. Check for complete retraction. If needed, repeat steps 7-10.